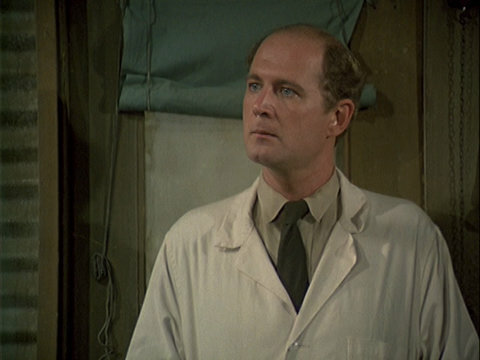 Capsule Summary: The 4077th needs a temporary replacement surgeon when Frank Burns goes AWOL so the stuffy Charles Emerson Winchester III is sent to help out. When Frank gets a transfer and a promotion, Charles is assigned to the 4077th permanently, much to his horror. As I mentioned in my review of “Margaret’s Marriage” earlier this year, the writers wanted to bring Larry Linville back for a farewell episode at the start of Season 6 but he declined to return. According to Ken Levine, no script was ever written but a story was planned out to give Frank a proper farewell. That’s basically what happened when Gary Burghoff left M*A*S*H.
Because Linville didn’t want to come back, the writers had to craft an episode that wrote Frank out of the series without actually featuring Frank. That’s more or less what happened to Trapper when Wayne Rogers left M*A*S*H after Season 3. However, Frank plays a much larger role in “Fade Out, Fade In” than Trapper did in “Welcome to Korea.” Trapper went home to his family and Hawkeye never got to say goodbye. That was the end of it. That could have happened to Frank, too, but it would have been repetitive. Instead, the writers decided to have Frank suffer a breakdown following Margaret’s marriage to Donald Penobscott and use that to explain his departure from the 4077th. Rather than simply have him sent home on a medical discharge, Frank was given both a promotion and a transfer stateside. It may have upset viewers as well. Allowing Frank–the “villain” on M*A*S*H–to go home while everyone else remained in Korea might appear cruel. Or is it a perfectly reasonable thing for illogical, irrational, and irrefutably absurd military to do? The reaction to Frank’s transfer back to the United States is hilarious. I wonder who came up with having everyone throw papers in the air after the toast in Colonel Potter’s office. Of course, their jocularity turned to disgust when Frank called and told them about his promotion and transfer. I love it. There’s a bit of humanity in Charles, however. After B.J. has to take over for him in the O.R., Charles opens up about his concern that he can’t adjust to meatball surgery. Of course, he then proceeds to insult them all. I was there for the creation of Charles Emerson Winchester. The idea was to replace Frank Burns with a character that was very much his opposite. We all wanted Charles to be smarter and more gifted as a surgeon than Hawkeye or B.J. and, as opposed to Frank, a worthy adversary. There were no auditions for the part. Producer Burt Metcalfe had seen David Ogden Stiers guesting on an episode of the MARY TYLER MOORE SHOW and thought he’d be perfect. It was only after David was hired that we learned he could do that slight Boston accent. Charles is no Frank. He’s a gifted surgeon and knows his way around a prank. I wonder what fans of M*A*S*H thought of Charles while watching this episode when it first aired. There are other minor storylines in this episode. One of them, the wounded battalion aid surgeon Captain Berman, ties into the Charles storyline. The others are unrelated: Klinger and his “lawyer,” Margaret and her worries about Donald becoming distant, the soldier who doesn’t want to return to the front because he doesn’t want to kill anyone else. They help flesh out the episode but don’t add much substance. Margaret’s problem with Donald lay the groundwork for her eventual divorce. CBS repeated this episode in two parts on March 6th and March 13th, 1978. It was later syndicated as two half-hour episodes. Radar supposedly smokes his first cigar in this episode even though he was seen smoking a cigar in several early episodes (including “Requiem for a Lightweight” and “Chief Surgeon Who?”). I honestly didn’t notice while rewatching the episode for this review but during the scene in the Officers Club when Charles is talking to Igor, it’s not Jeff Maxwell’s voice we’re hearing. It’s a mystery why another voice was inserted in post-production. Several sources online state it is Johnny Haymer’s voice. Haymer played Sgt. Zale. Some fans have theorized that Frank made up his own promotion and transfer as one last attempt to piss of Hawkeye and B.J. on purpose and get a last laugh for himself. I’m not sure if I entirely buy that – I don’t think Frank’s clever enough for that – but then again, that makes as about as much sense as the army actually promoting Frank and transfering him. That being said, I feel like the way Frank was handled in this episode was a lot better than how they handled Trapper (and Wayne Rogers was confirmed to have return to record the P.A. announcement at Kimpo, so why couldn’t have given us one last look at him before going home?) – even though we don’t actually see Frank, he’s definitely there in spirit, which made for a smoother transition to Charles. I quickly warmed up to Charles when he arrived, if only because I was already familiar with David Ogden Stiers – but mostly for his extensive career lending his voice talents to a number of Disney movies; Cosworth from BEAUTY AND THE BEAST is very similar to his portrayal as Charles, and also has a stuffy accent to accentuate the character’s snootiness. I do have one minor quibble with this episode, and that’s the minor subplot involving the soldier who didn’t want to go back to the front: B.J. offers to have him talk to Mulcahy (despite saying he’s an atheist), and he tells Mulcahy that he’s already killed three people, saw the agony in their eyes, and just doesn’t want to kill anymore. That’s it. Nothing else is said about it. Mulcahy offers up no words of comfort or wisdom, and we see no resolution to the soldier’s plight, we don’t know if he was sent back or not. It was really clumsy in an otherwise smooth episode. Regarding Charles going into the Officer’s club and talking to Igor, it was Johnny Haymer’s voice heard instead of Jeff Maxwell. Charles: My father knows Harry Truman. He doesn’t like him, but he knows him. Potter: Fine, you have Dad call Harry, then Harry will call me and maybe we’ll work something out. In the meantime, vamoose. Charles: All right, I am vamoosing. Just watched this one on DVD for the first time. I had never seen that scene with Hawkeye, BJ, & Father Mulcahy in the mess tent talking about Burns before. It must be cut on the TV Land/ME TV runs. I always thought it was strange how they ended season 5 with Burns being relatively okay (albeit sad) about the whole thing, and then all of a sudden he’s on R&R and gone bananas. This scene at least gives some explanation from BJ and Hawk about it. Pretty sure the scene with Radar puking from the cigar is cut from tv runs too because I don’t recall that either. I think Frank’s character had gotten stale by that time-Charles was indeed different, able to hold his own both in the OR (eventually) and against Hawkeye and BJ. And he did have more humanity and compassion than Frank ever did. This episode inspired me to learn cribbage. Pretty sure he was mentioning that he owed Charles money, there’s simply no other time Potter could have learned that, and he mentions it to Charles later. I often wondered about that as well-who would allow Frank Burns to be in charge of anything, let alone a hospital? Charles’ reaction to the 4077th-from the smell to the food-is classic Winchester, although he would adapt in his own way. He would also prove to have more humanity than Frank and truly show compassion. Wouldn’t the foot soldier get in trouble for basically abandoning Charles after the jeep exploded and telling him to hitchhike with what/whoever comes along? What’s the joke when Radar says, “What swell gloves” and Charles says something to which Radar reacts disappointedly? If memory serves, Winchester says “Calf” in his snootiest tone, meaning the gloves are made of calf-skin. This explains Radar’s reaction. Ah you know I always wondered what he said there too. It does sound like Calf, but also a bit like “Off” like he was telling Radar to stay away. It’s too bad that Larry Linville chose not to come back one final time. It could have been a great episode. As it turns out, Burns’ off-screen sendoff was pretty good anyway. Burns actually got the last laugh. Or maybe he didn’t, since Hawkeye and BJ got to pack his belongings with the “system” they used. Regarding whether Frank was lying about his promotion, it probably would have been easy enough for Potter to use his connections to find out the truth. I choose to believe that Burns did get the promotion, since one of the major themes of M*A*S*H was to comment on the absurdity of the military. Charles was a much better character overall, but Frank’s lunacy was definitely missed in subsequent seasons. 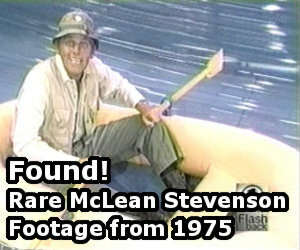 Yea it really is too bad Larry couldn’t come back for one more episode, just like Trapper. I understand there’s legal mumbo jumbo behind that with contracts and all that, but out of love for the character and fans, Larry and Wayne couldn’t just show up at the studio to do a proper send off? Even without a contract and all that, I’m sure the producers and directors would have let them in the studio to do it. Imagine if Hawkeye DID make it to Kimpo in time to see Trapper off, what an awesome “cameo” that could have been at the end for Wayne. At least they got Gary back to do his send off. Also, they did at least they handl Franks departure a bit better than Trapper’s by having the on-screen characters communicate with him like he was really there. I never understood why the writers decided to separate Margaret and Frank. With a few more human moments from Frank like the one in Sticky Wicket, the show could have easily gone for at least two more seasons having Margaret as an ally to Frank. He was truly alone in Season 5, I don’t know how Linville was able to get through that. As RJ put it, the character became pathetic. That said, Charles is a great character and one of my favourites too.